“Dream Big, Aim High”, reads the rustic red and white sign above the bed in this cosy shepherd’s hut. It seems fitting given the location. With the wood-burner stoked up for the night and the quilted double duvet pulled snuggly around you, you’ll certainly enjoy sweet dreams, while the setting, in the heart of the Peak District National Park is about as high as they come. The highest settlement in England, the local village of Flash, is less than a mile down the narrow lane. 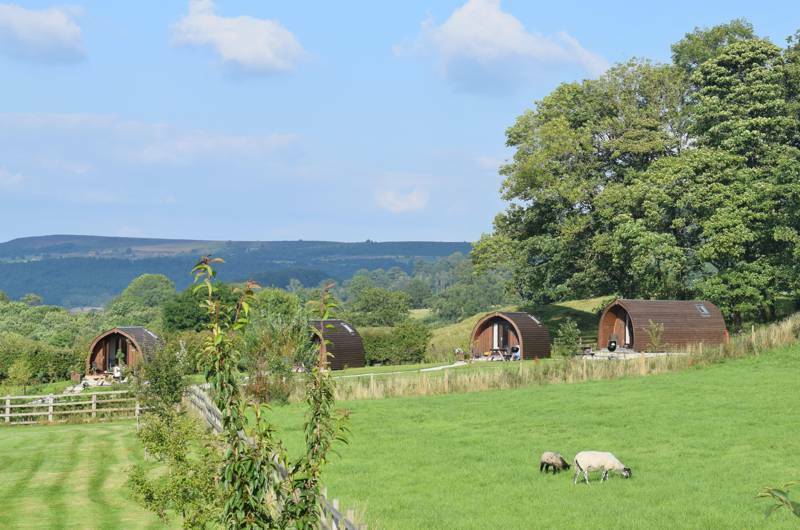 Yet, while we can wax lyrical about the views, the surrounding mountains and the drystone-wall-striped scenery of the Peak District, it’s the nuts and bolts of hospitality that this glamping site really gets right. Set in a one-acre meadow on Gollin Farm, the two-person shepherd’s hut has an interior reminiscent of an old country cottage – think chunky Welsh dresser, deep armchairs and a stack of logs that will keep the fire going until morning – while outside there’s a firepit for late-night s’mores toasting and a barbecue for farm-shop steak. Since there’s just the one hut on the site, you’ve the whole place to yourself. There’s plenty of room to kick back beside the hut and it’s a short stroll down the meadow path to a modern toilet and shower, watched along the way by your neighbours: chickens, sheep and a single pet deer that thinks she’s part of the flock. If you come in springtime you’ll have the added bonus of buoyant lambs on site too. 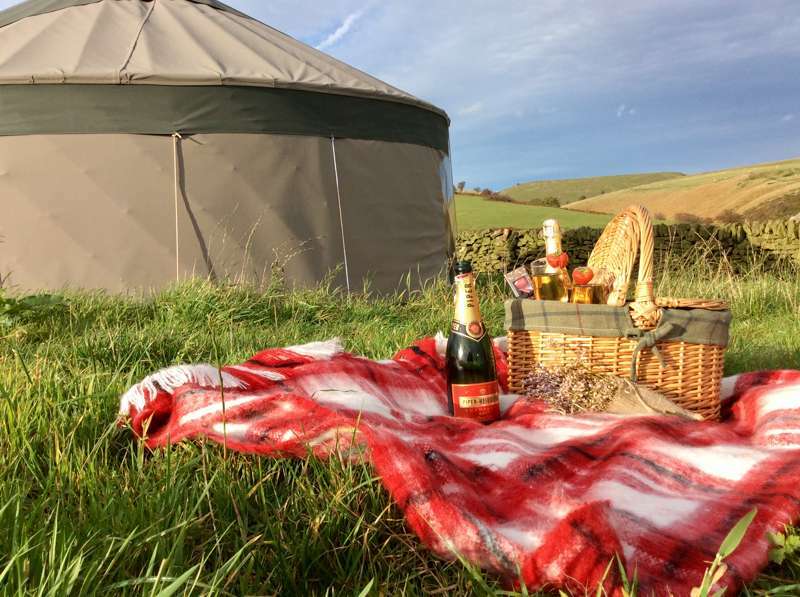 While candles beside the bed, board games for rainy days and a digital radio on standby make the shepherd’s hut a neat retreat for couples, it’s walkers and outdoor enthusiasts that are most in their element. There are ample walking opportunities right from the doorstep, from Axe Edge Moor and Crome Hill to the Three Shires Heads (the hilltop point where the boundaries of Staffordshire, Cheshire and Derbyshire all meet), while nearby towns like Buxton provide popular café stops for lunch. The village of Flash, though rural, also has a decent café and pub, which acts as a popular starting point for hikers. Since it’s the highest point in England you can convince yourself the walking will all be easy downhill, too. No doubt the spectacular views – of brown peaks and rocky outcrops – will quickly make you realise otherwise. For latest availability and best prices for Gollin Farm Shepherds Hut, please use the Date Search above. 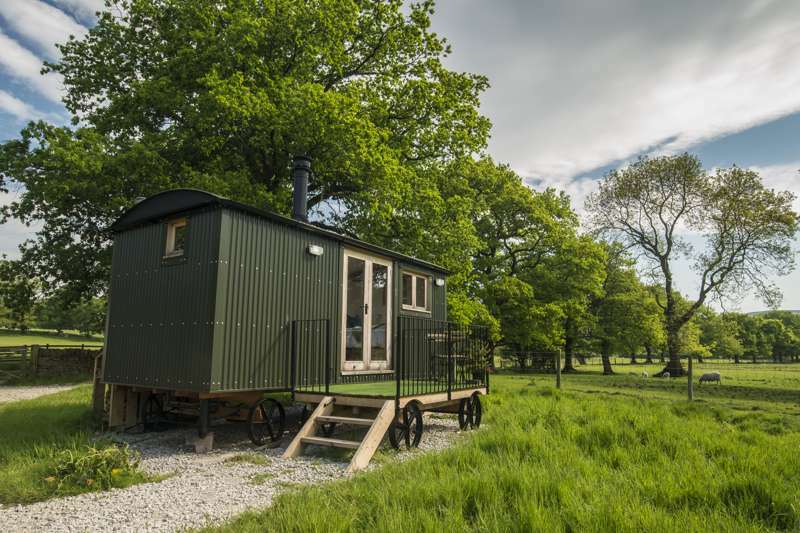 A single shepherd's hut (sleeps 2 adults) in a 1-acre meadow. The hut has a built-in double bed (bedding, linen and towels provided), 2 arm chairs, a side table with sink, a wood-burner (free logs and coal provided), electricity, microwave, kettle toaster, tea, coffee, mugs and more, plus a DAB CD radio. We also have broadband for you to connect. Gas BBQ, campfire pit and picnic table outside, plus a fridge in the nearby garage. 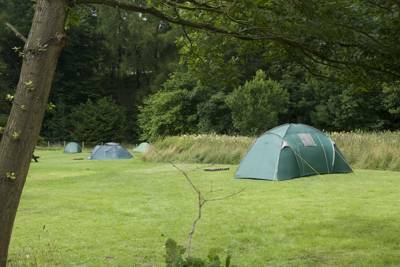 A modern toilet and shower block is located around 100 metres from the hut (toiletries provided). Plenty of free parking and secure space for bikes. Sheep, a turkey, chickens and a pet deer in the adjacent field. 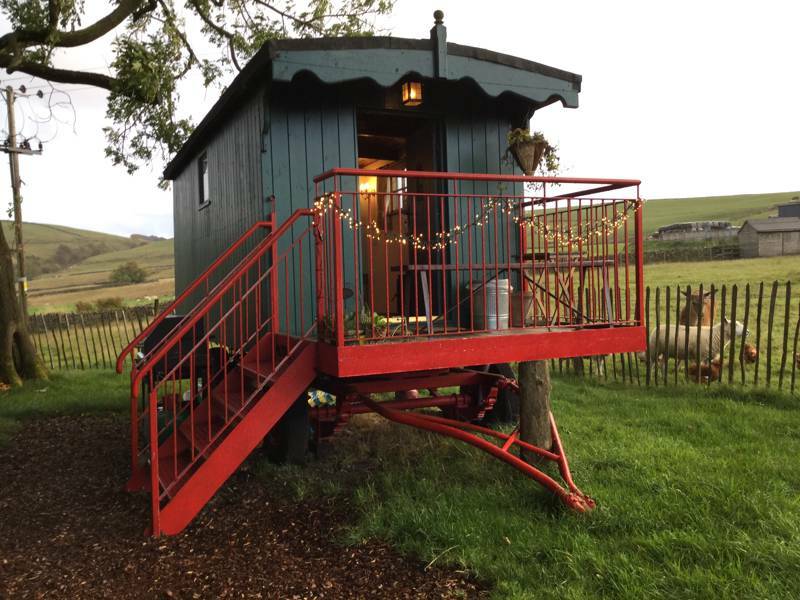 The rural shepherd's hut is in the heart of the hills of the Peak District National Park, with England's very highest village, Flash, just 1 mile away. The result is an abundance of good walking opportunities from the doorstep, including the Manifold Trail, Monsail Trail and Tissington Trail and short local routes up Crome Hill. Picturesque Hollinsclough village is a short stroll away, while Macclesfield Forest (20 mins drive) offers a wealth of outdoor activities and wildlife to spot, including the heronry at Trentabank Reservoir. Buxton (the highest spa town in England, if you're counting) is 5 miles away and home to Buxton Opera House (01298 72190), The Dome Theatre (01298 330620), swimming baths, go karting, Go Ape (01603 895500), pools cavern and many other activities. History buffs should head to the much-filmed Chatsworth House (01246 565300). It's 1 mile to Flash Bar Stores Café (01298 22763), which does a decent breakfast, pies and traditional Derbyshire oatcakes – dine al fresco for spectacular views. The Winking Man (01538 300 361) in Upper Hulme and The Lazy Trout in Meerbrook (01538 300385) also come highly recommended for evening meals. For something a little different, The Knights Table (01298 23695) in Quarnford is a medieval-themed restaurant with a meat-heavy menu that will fuel you back up after a day's hiking in the peaks. Buxton's market days are every Tuesday and Saturday on the Market Place in Higher Buxton. Leek's main outdoor market is on Wednesdays, with indoor market days on Wednesdays, Fridays and Saturdays in the restored Victorian Butter Market. £80 per night for 2 people. A car is highly recommended, due to the rural location but the nearest train station is in Buxton, 5 miles away.